Eliminating silos between marketing, sales and service is critical to delivering the seamless experiences that customers expect. Organizations want to differentiate competitively through customer experience—and that’s creating a convergence between the customer relationship management (CRM) and customer experience market segments. 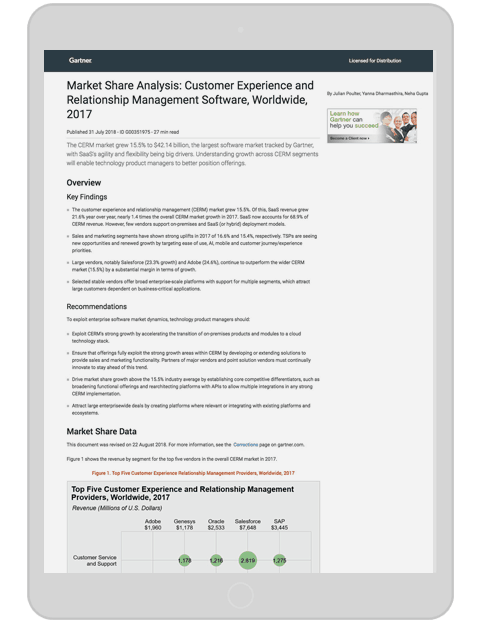 The Gartner Market Share Analysis: Customer Experience and Relationship Management Software, Worldwide, examines the CERM market to understand growth of customer experience across customer service and support, sales, marketing and digital commerce.